Harley & Angela Pass the Therapy Dog Examination! Yipee! Bethlehem resident, Angela Jones & Harley passed their exam in November 2010 to become registered with Therapy Dogs International. Therapy Dogs offer unconditional companionship unique to the human-animal bond. They visit people of all ages in the hospital, residential retirement centers, accompanying special needs students in school or young children at the library as a cuddly non-judgmental listener. Angela has been a dog lover since childhood. She has a knack for employing creative ways to integrate her love for animals and the natural world into her work. Her career in mental health and education spans nearly three decades. Earlier in her career, she worked in Wilderness Based Education as an Outward Bound Instructor where she became involved with dog sledding in northern Maine and Minnesota. This career took her to Nome, Alaska where she and her family became involved with the Iditarod Sled-Dog Race as hosts to the racers and their support team after they finish the 1500 mile race from Anchorage to Nome. Several years ago, she met two Therapy Dogs in a local school while providing a series of Yoga consultations to special needs students. She said she immediately recognized the important role these special canines have in the lives of the people they meet. Through this experience, she recognized Therapy Dogs are “born”, not trained, just as is a good sled dog; a good sled dog requires physical stamina for work, speed, and endurance. Some breeds are better suited than others. For example, when she tried training her beagle, “Lucy”, for pulling. Every time Lucy would get a sniff of another critter’s scent, off she’d go with sled. Beagles don’t make the best sled-dogs. However, any breed can be a Therapy Dog. 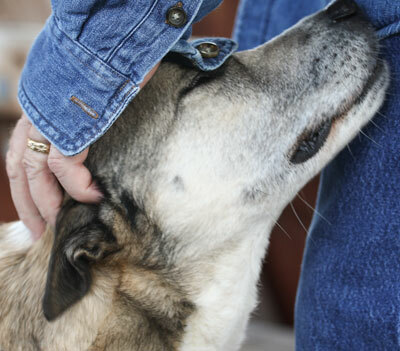 A Therapy Dog has tolerance for other animals and a calm temperament. Although some skills can be taught such as obedience, traits for a Therapy Dog are born part of the personality of the dog. Harley is a 9 year old Husky-mix. Angela admits to being nervous about the 10 step Therapy Dog exam and said Harley made passing easy. Angela and Harley mostly work together in her clinical practice. She doesn’t assume everyone is comfortable with dogs and offers the choice to have Harley present or not. She says, when Harley is involved, she immediately breaks the ice during first time meetings and helps set a tone of comfort and ease that is important for developing trust and a sense of safety. Angela provides individualized strengths-based counseling and evaluation services as a Master Licensed Alcohol and Drug Abuse Counselor. She holds registration as Trauma-Sensitive Yoga Teacher for children and adults and incorporates cutting edge research based mind-body therapies in her clinical practice.